When it comes to feeding your cat, you may be wondering whether wet or dry cat food – or a combination of the two – is the best choice for their mealtimes. If you’re currently weighing up the benefits of both, in this article we’ll explain why it’s not a case of wet vs dry cat food – but that instead the answer might be a mix of the two! Did you know that a cat’s sense of smell is typically 14x stronger than that of the average person, making smell their primary way of interacting with food? Wet cat food provides a rich aroma, which is important for cats to stimulate their appetite. Wet food also increases your cat’s water intake, helping to keep them hydrated and supporting a healthy bladder and urinary system. Find out more about the benefits of wet cat food. In terms of benefits for you, dry cat food is convenient to store and if you leave it in your cat’s food bowl it won’t dry out – this makes it perfect for grazing. Some dry cat food is also specially formulated to help control the tartar levels on a cat’s teeth, meaning it can help maintain good oral health. Ultimately, both kinds of food have different benefits for your cat. As long as the cat food you choose is nutritionally complete, either option will provide all the essential nutrients they need so you won’t need to add anything else. Whichever you choose, the palatability of your cat’s diet is essential – find out more about the importance of palatability. Ultimately, both dry and wet cat food have their benefits, so the answer to the question ‘should I feed my cat wet food or dry food’ might actually be both. 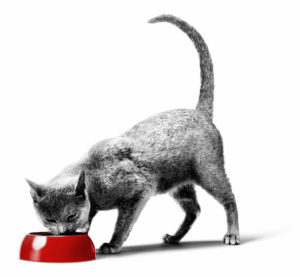 At ROYAL CANIN® we believe every cat is unique and deserves a nutritional programme that respects their individual requirements and preferences, to help bring out their very best and support optimal health. A wet and dry cat food diet – what we call mixed feeding – could be the right answer for your cat. A combination of both wet and dry complete food will give your cat all of the benefits provided by each food type, like a rich aroma to stimulate their appetite and the crunchy kibble to help support dental health. Mixed feeding a complete wet and a complete dry diet means that you don’t have to sacrifice the benefits of one type of food for the sake of the other, and you can also provide your cat with variety in texture and taste while meeting all of their needs. If you do decide to mixed feed, remember to adapt the daily feeding amount to take into consideration both foods. Feeding a full day’s allowance of both diets will double your cat’s calorie intake and quickly lead to excess weight gain. When mixed feeding, we recommend feeding the wet and dry versions of the same cat food – rather than using separate products tailored for different requirements – in order to provide the right amount of specific nutrition to meet your cat’s requirements. Through experience, we have found that feeding two thirds of calories from dry food and one third from wet food seems to be the preference for many cats. Finally, always consult your vet about your cat’s individual needs before making any changes to their diet. Explore our ROYAL CANIN® ranges of wet and dry cat food to find the ideal nutritional answer for your pet. Hopefully this has helped you understand the differences between dry and wet cat food, as well as the benefits of mixed feeding. However, if you have another question about mixed feeding, your cat’s health, or other facts about your feline friend then we’d like to help – sign up to our newsletter below. How Important Is Palatability to Your Cat?